Ebisu on Broadway is a little hard to find since the front door is not on the sidewalk but it is only a short walk from the Canada Line and even closer to the 99 bus stop. I went on a weekend evening with a large group at around 8pm and the service was slow. The server was not rude but everyone was inattentive and I had to ask twice before I got my cup of tea. The food also took more than 50 minutes to come. With the slow and inattentive service, I wasn't expecting great food from Ebisu but fortunately it turned out good. Happy Hour menu is 7 days a week starting at 8:30pm. I wanted to try the raw oysters but they were out. We ordered three things from the Happy Hour menu: gyutan saikyo, dynamite roll and spicy tuna. Gyutan Saikyo (not pictured): This dish was thinly sliced grilled ox tongue and it was only $4.95! Although the best ox tongue I've tried in Vancouver is still Maruchu, the one at Ebisu is a good deal and tasted pretty good. The meat was chewy and the sauce was buttery. Dynamite Roll (not pictured): I think every restaurant makes dynamite rolls differently. At Ebisu, it was rice and seaweed wrapped around tempura shrimp and thin cucumber slices. The presentation was nice. I guess that's why the food took so long to come because the chefs were backed up on making the food look presentable. 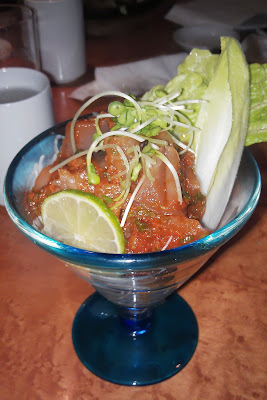 Spicy Tuna: The tuna was chopped into small pieces and mixed with chunky spicy sauce over lettuce and julienned radish. It's a refreshing appetizer. 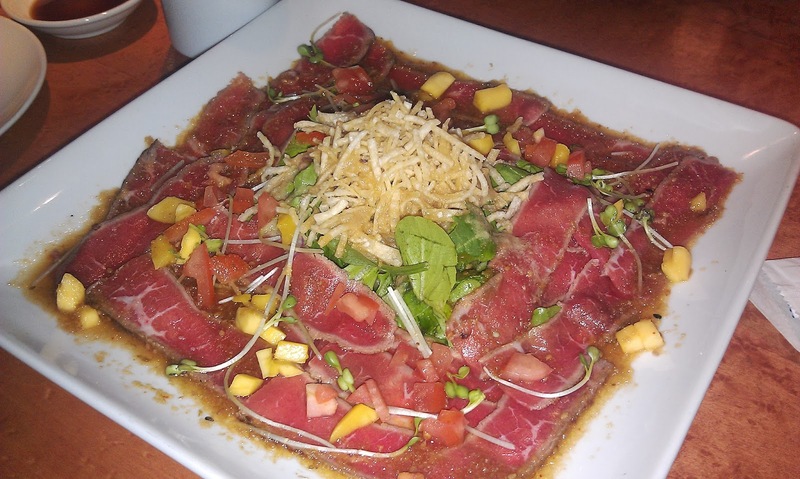 We ordered the Beef Carpaccio off the regular dinner menu because it looked so good when I saw it on a counter in the restaurant. The yellow heap on top are fried wonton strips, underneath is a pile of spinach and the raw beef surrounded it all. I enjoyed this dish with the raw beef texture, crunchiness of the wonton and freshness of the spinach all soaking up the carpaccio sauce. Overall, I might visit Ebisu again on a weekday but definitely not during its busy hours where I will have to wait an hour for my food.